​Aspen Rayne Ranch is located south of the Kansas City area. Our home sits on 39 acres between Harrisonville, MO and Garden City, MO, and has much of the main floor finished in... aspen wood, of course. Named for our daughter, Aspen, Aspen Rayne Ranch had started as her own FFA herd project in high school. Now that she has moved on to college, the need to separate and duplicate everything for the sake of FFA record keeping is no longer required. Therefore, we are all one big happy herd under the moniker Aspen Rayne Ranch. Same great llamas. Same great service. We have added some fun critters. Not just to the pasture, but to the breeding plan as well! We now own Miniature Silky Fainting Goats and KuneKunes. Even though we don't have the time to show what we create (because we are so dedicated to our llamas) we still strive to breed and produce only the highest quality of ANY animals we bring home. We are the Aulds. We have owned our own llamas since 2006 but have been around llamas since 1987 when Steve's uncle, Charles "Buzz" Kraft, started his herd in LaPorte, Minnesota. Steve and Sandy have been married since May of 1987 and have two wonderful children. Our son Talon was born in 1993 and Aspen in 1996. Aspen remains active in the operation of the farm as our herd manager and main show handler. Aspen is also working her way to become a large animal veterinary technician since she already does the lion's share of the vet work around the farm. Aspen is also working through her ILR-SD judging apprenticeships. Steve is a certified ILR-SD llama judge and working through his ALSA apprenticeships. We hope you enjoy your visit to our farm, and if you’re in the llama business, we can't wait to make your acquaintance and swap some stories. While we may have only owned our own llamas since August of 2006, we were first introduced to the "world of llamas" in 1987 by Steve's uncle, Charles "Buzz" Kraft. It was while spending many weekends with Buzz at his farm near LaPorte, Minnesota, that we were bitten by the llama bug and began our llama journey. We learned a lot from Buzz and his experiences and carry many of those nuggets of knowledge with us, along with all the ones we have gained since, in everything we do. Steve and Aspen are each accomplished judges in both the llama and goat industries. Steve is a dual certified llama judge for both the International Lama Registry's Show Division (ILR-SD) and the Alpaca Llama Show Association (ALSA) in halter, performance and youth. Steve has been judging miniature silky fainting goats since 2014. Aspen is an ILR-SD apprentice judge, has judged many 4-H llama shows and has been judging miniature silky fainting goats since 2015. We select our foundation animals with the eye of a judge, show many of the babies we produce and are critical about the purpose of those we sell. If you are interested in a show animal, we definitely know what it takes for an animal to show well. If you are just looking for a pet or guard, we occasionally have those available too. We have been recognized as a breeder and for the llamas we own and have produced on a national level. We are not just in the business of llamas to sell llamas. We are in the business of llamas to introduce, mentor and assist current, new and future llama owners to the wonderful world of llamas. 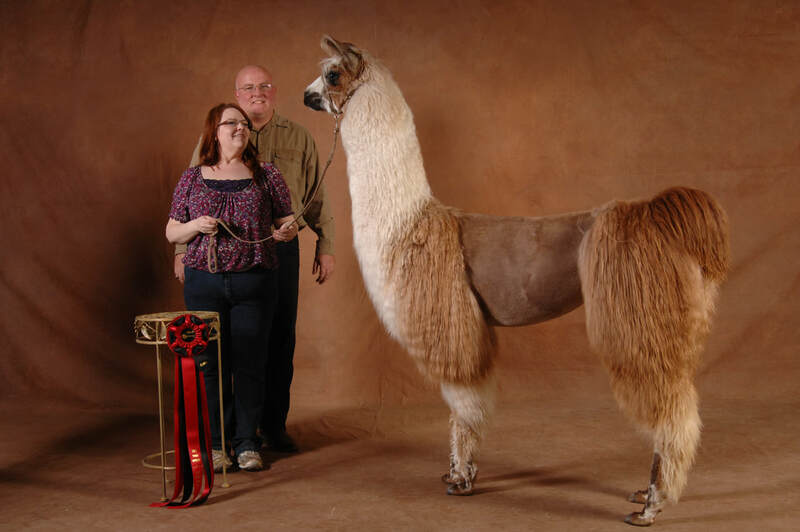 We have sold many llamas to first-time llama owners as well as small hobby farms. Most of these farms have become good friends who contact us throughout the year with questions, concerns and requests for assistance with shearing, shots and routine maintanance. We do not want to just "dump" an unwanted animal on a new owner. We want new owners to become passionate llama enthusiasts just like we are. So whether your new llama is for the show ring or to just keep the pasture grass at bay, we want our new llama friends to know how to care for their llamas.